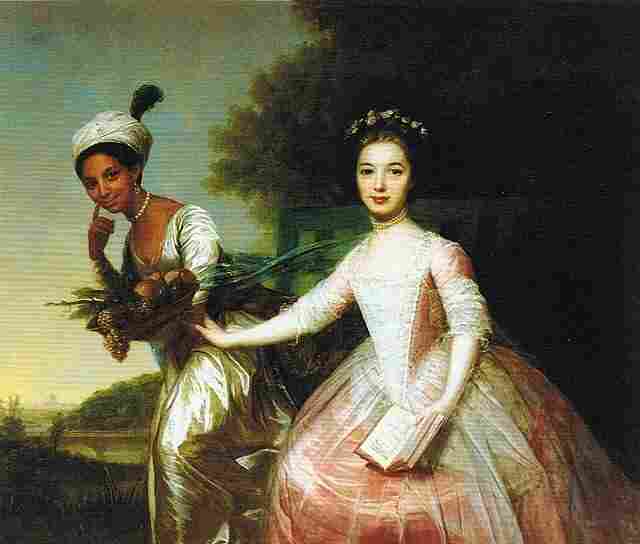 Interview: Amma Asante, Director Of 'Belle' Director Amma Asante's new film is based on the real-life story of a biracial woman who grew up in an aristocratic English family — a story that was immortalized in a painting by Johann Zoffany. Johann Zoffany's 18th century painting portrays Dido Elizabeth Belle and her cousin Elizabeth Murray. Director Amma Asante found the story behind her new movie, Belle, in a painting: artist Johann Zoffany's 18th century portrait of two beautiful, young English ladies, draped in silks and pearls. The twist? One is biracial. Belle is based on the real-life story of that woman, Dido Elizabeth Belle, who was the daughter of a Royal Navy captain and the slave he met after capturing a Spanish ship. As a young girl, Dido's father brought her to the grand country home of his uncle and aunt, who were already raising the daughter — white, of course — of another nephew. They agreed that girl was much in need of a companion like Dido. But instead of bringing Dido up as a servant, they chose to bring her up as a member of the family. Dido's great-uncle was traditional, but with a progressive bent. As Britain's top judge, he eventually decided a key legal battle involving the slave trade, all while raising his mixed-race niece whom he adored. "Around the time of the 18th century, we really were — people of color were — an accessory in a painting. We were there rather like a pet to express the status of the main person in the painting, who was always white. And for anybody who's lucky enough to see the painting, what you see is something very, very different. You see a biracial girl, a woman of color, who's painted slightly higher in the painting, depicted slightly higher than her white counterpart. She's staring directly out at the painter, you know, with a very direct, confident eye. ... So this painting flipped tradition and everything that the 18th century told us about portraiture." "These two girls were aristocrats. You know, they held very high positions in society; their family held a very high position in society. What I saw from the painting was this opportunity, if I got it right, to tell a story that would combine art history and politics." Click the audio link above to hear the rest of Morning Edition's interview with director Amma Asante.